You are here: Home / freebies / FREE Redbox codes! My family LOVES movie night and we’ve got several Redbox kiosks near my house, which makes it very convenient! 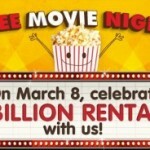 I love it even more when I can score FREE codes to rent my movies and games! There’s a NEW Free Redbox game code, too! Text TOMB to 727272 to get your code! This offer is valid through 6/30/13. NOTE: You do have to swipe a credit or debit card to “rent” the movie and you will be charged $1 per night if you do not return the movie before 9 p.m. the following day. To enter your Redbox codes, look for a circle at the bottom of the screen at check out that says “promotion code” and enter it there! If you know of any other Redbox free codes, let me know! 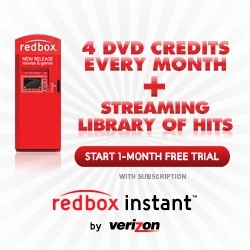 Get Redbox Streaming FREE for one month plus 4 free rentals! After that, you’ll pay just $8 per month for this service! I currently spend $8 per month on Netflix streaming and I still spend money every month at the Redbox kiosk, so this is definitely worth checking out! 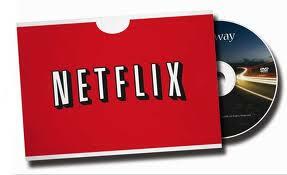 Netflix free 30 day trial – We subscribe to Netflix and use the streaming service and love it! Thanks to Netflix Streaming, we were able to downgrade to the basic cable plan plus there are no commercials! Netflix also has Disney movies now!! NOTE: If you sign up for the free trial of Netflix, and you don’t want to continue your membership or be charged, make sure you mark your calendar so you can remember to cancel within 30 days! 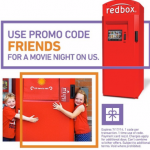 FREE Redbox Movie Rental Code! 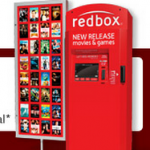 FREEBIE ALERT: Free Redbox Movie and Video Game Rental! 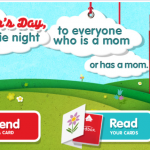 FREEBIE ALERT: FREE Redbox Movie on Mother’s Day!